Can you earn minimum wage and still become a millionaire? The short answer is yes! I am sure you have heard of so called poor people becoming millionaires, although not overnight. I am not talking about professional athletes, entertainers or lottery winners. I am talking about everyday people earning very little money and over time become millionaires. Not just millionaires, but multi-millionaires! You are probably thinking how can someone who is earning so little become a millionaire. Well it is not easy, but becoming a millionaire is not easy anyway! It all starts with a goal! 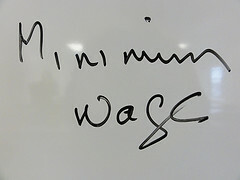 If you are earning minimum wage it may take more sacrifice or effort, but it is possible. Your first step is to find some money to save which can be as little as $4 per day. Savings is the best way out of poverty! Finding savings when you are earning so little is no easy task, but it is possible. Little things can yield a lot of money. Something as simple as buying coffee, grabbing a donut or buying lunch can easily exceed $4 per day. You may have to have roommates or find additional ways to reduce your expenses. Usually people who work minimum wage jobs start early so you have the advantage of time. With time on your side, you can get training to improve your earnings capability. Whether you decide to go to college, enter an apprenticeship or additional training, you can increase your income. You could start a business, work overtime or sell things. Learn how to add to your income by learning new skills. Make things, sells extra things, offer services such as mowing lawns, babysitting or other odd jobs. Budgeting is not just for people who earn more money. Actually budgeting is even more important for people who do not earn much. Remember a budget is a structure to help you achieve your financial goals. Start budgeting and you will find where you are spending your money. This is the first step to find extra money for savings and help you make better spending decisions. You start out earning minimum wage, but you do not have to stay there! You do good work and you receive increases, promotions or change jobs to earn more money. Every time you earn more, you add 50% of any increase to savings. It helps accelerate your savings and will bring to millionaire status a little sooner. The key to becoming a millionaire is not spending it all. This is very hard to do when you are earning minimum wage! If you think this is easy, then everyone would do it! When you are earning minimum wage, you already cut a lot of things out just to have some savings. You do side jos or work overtime just to have a little extra. You have to keep your eye on the goal and stay motivated to stick with your plan. Progress to your goal is some motivation but not all of it. We often think that minimum wage earners cannot save any money or do much about their plight in life. That is a myth! All it takes is some discipline and a willingness to do something about it. Isn’t that true of all of us? A plan such as a budget can be the discipline to help us reach a financial goal. What are you doing about your financial goals? You are probably earning considerably more than minimum wage and cannot save $4 per day. If a minimum wage person can reach millionaire status, you can too! If a minimum wage person can reach millionaire status, you can too! Where you live is also a big factor. If you’re earning minimum wage in a major metro area, you’re not going to be able to save much, if anything. If you’re living in a suburb or mid-sized town, then it’s easier to put some money away. It may be easier, but not much different. In a major city, there are more choices. I lived in an expensive city on a regular wage but since real estate prices were pretty high I was able to take roommates in and cut my rent to $150. You also have access to public transportation so no need for a car, cheap supermarkets, a ton of free cultural options, a cheap airport hub nearby for holidays, etc. I also live in an expensive are of the country. There is no reason why everyone cannot save and invest, no matter their income. If you’re willing to learn about finance and side hustle, wouldn’t it just make more sense to learn an in demand skill? Maybe spend your evenings learning computer programming online for free and then jump out of the minimum wage job? Training is key, whether it is self study or classes. Of course, learning skills is not limited to classes. You could just get promoted. Transportation costs are a big factor, if you’re putting a huge chunk of your pay for a car, gas, and upkeep, you will find it that much more difficult to come out ahead. I would think most minimum wage people would use the bus or walk to work. I’m sure it’s possible. You could also win the lottery! I kid, I kid. But in all seriousness, I think it depends on where and how you live. There is a janitor at school who is building up a couple rental homes. I realize he is making more than minimum wae, but he is sacrificing for the future. Good post! I totally think it’s possible, it just requires being committed as well as creative. I think it’s much easier for someone to say that it’s not possible, but I really think it is possible as long as it’s something “you” want to achieve. What I am really saying is income is not a limitation for savings! 🙂 So you young college graduates earning $40-50K should have no excuses. I know because I saved when I had a very small income and continue to save even when my income is lower. Those who save a million or more on very low wages without much or any investing or a side hustle usually have a few things in common: They are single for life, they inherited their home and never had mortgage payments, and they either use public transportation–sparingly–or buy their cars used and keep them for 20 years or longer. They also live lifestyles of extreme frugality that most people would reject, too. The lesson isn’t so much to emulate them (increasing income and active investing are both MUCH more appealing ways to grow wealth) but to understand what’s really necessary in our lives and what things we label necessities that really aren’t. Yes, they saved and invested however meagerly. My point is if they can save and invest, no one has an excuse. It’s possible if you’re committed to saving and investing, which unfortunately most people making around minimum wage aren’t. It really doesn’t matter how much you make, even small amounts start to add up quickly over time! I wrote an article called $12K Will Make You Rich showing how contributing as little as $2K per year for your first six years will be over a million dollars when you retire. Starting early, however small will yield a lot 40 years later. Training really does seem to be one of the most worthwhile investments. Education seems to be undergoing a major change with the massive debt that has been incurred, however. If the minimum wage worker has some skills, he/she may receive additional training. Of course, the worker could get training on their own such as community college, voctional or apprenticeship. When my girlfriend and I earned minimum wage, we still found ways to save money whenever we could. We worked hard, and did everything possible to learn more (outside a traditional education) so we could get better paying jobs in the future. Now we do make more, but our expenses are higher too so we save about the same. If we had made different financial choices between then and now, we’d be able to save a LOT more money. Anyone who wants to make/save more money will find a way if they truly want it bad enough. I think it helps when you make savings a priority! If you start with a goal of 10% savings and adjust your expenses, you are more likely to achieve it. People at all income levels can create excuses for not saving. If someone living on minimum wage can do it (and they can) then we all can. Great thoughts Krantcents! Thank you, that was my point! Nothing is really impossible if you are really determined with your goals especially in becoming a millionaire. There are a lot of ways you can do. All you need is the determination and the right attitude. Determination is a hue part as well as goals and a plan. One of the best ways to make this happen… and I do believe your premise is true, is to start in your 20’s investing a small amount in diversified stock index funds, continue through thick and thin. Yet, even if you’re not in your 20’s it is still possible to amass a million dollars thought conservative living and consistent investing. I agree saving and investing early is the key to reaching that goal. Even if you start with a small contribution, you can achieve the goal. Actually, the first step is saving and investing. Then, you can increase your savings as you get promoted, get training or skills and yes, earn more. Funny you should mention this. Sometime ago now, I read somewhere that one can become a millionaire on saving (and investing) $2.84 per day. Sound impossible but were one able to make 1:10 return (which can’t be done investing in shares and stocks; one has to be more inventive), one can have ove $11 million in five years. Assume a bit more modest return and becoming a millionaire is not hard (mathematically). At $2.84, you would have to have a better than average return on investment. Starting early and consistently will achieve millionaire status over time. A good way how to start saving is by using “pay yourself first” strategy and then live on the rest. Hard but possible. If you open a brokerage account and start investing into commission free ETFs paying the dividend and contribute to that account as soon as you receive the paycheck, you may become a millionaire pretty soon. Earning minimum wage, means you start small! Perhaps $25-50 per week. The amount almost doesn’t matter at first, then you increase it as you receive increases. It wouldn’t be easy but it certainly is possible. Keeping spending within your means would be essential. $4 a day may not sound like a lot but that adds up to almost $1500 in one year. That’s a great goal to start putting away savings. I wrote an article called “$12K Will Make You Rich”. If you save just $2K per year for 6 years when you are in your twenties, you will reach millionaire status in 40 years. It is interesting because people always assume that if you don’t make “a lot” of money, you can never be comfortable. Given, if you make minimum wage, you have a tough road ahead of you. However, I know many teachers, firefighters and office admins that are doing just fine financially. Obviously these are not minimum wage jobs, but they are jobs that people don’t typically perform for the huge salary. If you can control your spending and take some time to learn about investing, saving is possible for just about anyone! When I started out, I was not earning a lot, but I saved and invested. The payoff was financial freedom in my late 30s! My parents grew to be very wealthy despite the fact that my mom was a stay at home mother then chose to work at our school for minimum wage. It can be done if you have the determination and make savings a priority. Absolutely! Time and compounding will make the smallest investment grow into something substantial. I don’t think it takes luck! Unfortunately, you won’t see the results for years which means you need to keep the faith for a long time. I think that if someone has the determination to save that diligently, they could probably work toward building up their career beyond earning minimum wage. That being said, the bigger point that someone can save even on a small income is one I agree with. If a person has discipline, avoids true bad luck (no unforeseen illnesses or accidents, etc), and doesn’t live in a high cost of living area, a lot is possible. Starting early and letting compounding work for you is key. Some of the same skills of personal finance are skills that will help in a career. Soft skills such as goal setting, determination, discipline etc. I think the keys are starting young, being dedicated and having faith that you’re making the right investment in your future (i.e. not touching the money when the market goes up and down). Almost everyone can save, even if it’s a little bit at a time. The most important factor is time so start young! Even low income individuals can save and invest. I think what you are describing is the American Dream. Hard work, diligence, and responsibility can pay off! Hopefully, it is not dead. Bottom line, instant gratification and keeping up with the Jones’ are the enemy. There are a lot of distractions, but it is up to the individual to stay on track! Better yet, just realize everyone can do it. Even if you only make minimum wage, I think it is possible to gain the needed passive income to become a millionaire. For instance, the internet does not discriminate by your pay rate, so anyone can start a blog and make money from it. Likewise, anyone with determination can try their hand at the real estate market. If you buy a house, you can use the equity on your home after about 10 years as a down payment on a second house. Essentially you could get a second house to rent out, that would pay the mortgage, plus some of your normal mortgage. Within 20 years, you would have both homes paid off and the money gained from renting would be scott free. It is risky, but very possible. I agree and I don’t even think it is any more risky than other investments. That would be awesome. I agree with the rest. It all depends of how you live and yeah, where you live is a big factor too. Everyone can save and invest, however small. If you start early enough, it can grow into a tidy sum. I would add that investing is also very important in addition to saving money. Investing is what allows our money to make us more money. Somebody who isn’t able to save and investing that much may want to spend time educating himself or herself about investments to maximize investment return rates. True! Saving and investing is the first step for a reasonably good future. Along with that you need to know whatyou are doing when it comes to investing. Most of people dream their dreams how to be millionaire. They waste money for lottery tickets,buy new clothes to seem rich. But they don´t see the basic points that need to start manage their own little budget and step-by-step increase the incomes or cut the outcomes. The sad truth is this is true for many poor people. The simplest route out of poverty is saving and investing.